Bhí seans ag foireann chispheile na gcailíní agus na mbuachaillí cuairt a thabhairt ar scoil St. Benedicts ag deireadh mhí Márta. Bhí St. Benedicts ag iarraidh an Ghaeilge a spreagadh sa spórt ina scoil féin, agus ba dheis iontach dúinne é ár scileanna cispheile a chleachtadh. D'imríomar cúpla cluiche cairdiúil leo agus thaitin an mhaidin go mór linn. Míle buíochas leis na tuismitheoirí a thug síobanna do na páistí ar an lá. ​​Lá Idirnáisiúnta na Leabhar - Bígí ag Léamh ! Tá go leor caint faoi láthair faoi dhúshlán MOMO. Cé acu an bhfuil gá leis an gcaint nó nach bhfuil, tá eolas anseo ó shaineolaithe na sabháilteachta ar líne. Is fútsa atá sé mar thuismitheoir/chaomhnóir tú fhéin a chur ar an eolas faoina bhfuil ar siúl ar líne. There is a lot of talk lately about the MOMO Challenge. Whether the talk is warranted or not, here is a link to some experts on Internet Safety. It is your responsibility as a parent/guardian t o educate yourself on what goes on online. Thugamar seic €3600 don Ospís ón Rith Urraithe - míle buíochas le gach einne as an tacaíocht agus as an gcabhair. Bhí breis is 70 ball de phobal na scoile i láthair chun cabhrú le maoirseacht agus le soláistí. An-ócáid. Buíochas le Múinteoirí Lára agus Gráinne, Cumann na dTuismitheoirí agus le hAnna san Oifig as an obair ar fad. We gave a cheque for €3600 to the Hospice - huge thanks to everyone for the support and the help. There were over 70 members of the school community present to help with stewarding and refreshments. A great occasion. Thanks to Muinteoirí Lára and Gráinne, Comann na dTuismitheoirí and to Anna in the Oifig for all the work. Brat na hÉireann á ardú sa chlós. A booklet is available for those who would like it. We can't send them home with children so you are asked to collect it in person form the school. Tá glactha ag an mBord Bainistíochta le dhá rang Naíonán Sóisearach don Mheán Fómhair 2019/2020. Tá an Bord ag glacadh leis an dá rang seo de bharr an éilimh ollmhóir atá ar áiteanna sna Naíonáin Shóisearacha i mbliana. Tá líon áirithe áiteanna fágtha agus glacfar le hiarratais ar na háiteanna sin ó 08:50 ar an Luan 21 Eanáir go dtí 14:30 ar an 8 Feabhra. Féach thíos chun na gnásanna iarratais a fheiceáil. Ghlac an scoil le dhá rang Naíonán Sóisearach ag amanna eile i stair na scoile, an uair is déanaí ná Meán Fómhair 2007, rang a d’fhág an scoil in 2016. Is cúis sásaimh agus mhórtais mhóir don Bhord é go bhfuil an t-éileamh láidir seo ar an nGaelscolaíocht agus ar Scoil Oilibhéir. Beidh cinntí faoi ionrollú na mblianta amach romhainn ag brath ar an éileamh agus ar thacaíocht leanúnach ón Roinn Oideachais agus Scileanna. Bíodh is go bhfuil fonn ar an mBord soláthar na Gaelscolaíochta sa cheantar a fhás, déanfaidh sé an obair seo ar bhealach céimiúil córasach, a luífidh lena fhís, ‘sé sin; cothú agus saibhriú gach páiste, trí mheán na Gaeilge, chun barr a gcumas a bhaint amach. The Board of Management have accepted two classes of Naíonáin Shóisearacha for September2019/20. The Board is accepting the two classes due to the large demand for places in Naíonáin Shóisearacha this year. There are still a very limited amount of places left and applications will be accepted from 08:50 on Monday 21 January until 14:30 Friday 8 February. Please see below for application procedures. The school has accepted two classes of Naíonáin Shóisearacha at different times in the past, the most recent time being September 2007, the pupils of which left Scoil Oilibhéir in 2016. It is a source of immense satisfaction and pride to the Board that there is this strong demand for both a Gaelscoil education and for Scoil Oilibhéir. Decisions regarding enrolments in future years will depend on demand and ongoing support from the Department of Educaton and Skills. While the Board is keen to expand the provision of Gaelscoil education to children in the area, it will carry out this process in a systematic, graduated manner in line with its vision which is to nurture and enrich every child, through the medium of Irish, in order to achieve their potential. 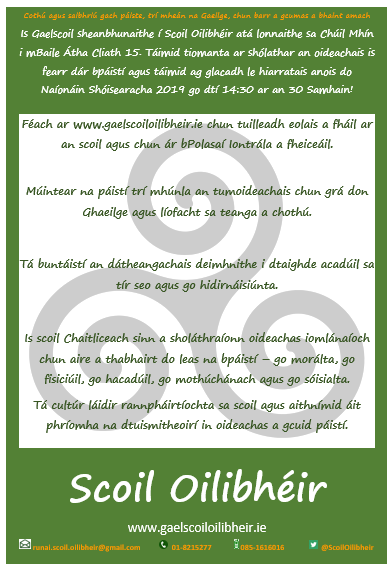 Beidh Ranganna Gaeilge ag tosú do dhaoine fásta sa scoil ar an gCéadaoin 3 Deireadh Fómhair. Beidh Rang do Thosaitheoirí agus beidh Rang Idirmheánach. Beidh 10 seachtain ann, 20:00 - 21:30 agus beidh costas €60 orthu. Tabharfar tús áite do thuismitheoirí na scoile ach beidh fáilte roimh dhaoine fásta eile má tá spás. Caithfear ainm agus airgead a thabhairt do Chumann na dTuismitheoirí roimh an Déardaoin seo chugainn 28 Meán Fómhair. Our Irish Classes for Adults will be starting on Wednesday 3 October. there will be a Beginners' Class and an Intermediate Class. There will be 10 weeks, 20:00 - 21:30 and there will be a cost of €60. Parents form Scoil Oilibhéir will be given priority but any other adults will be welcome if there is room. Names and money must be given to Cumann na dTuismitheoirí by this Thursday 28 September. Buíochas ó chroí libh uilig as ucht bhur dtacaíocht don Díolachán Cácaí. Bhailaíomar €1130 ar son Forás Croí na hÉireann.Thank you all for supporting the cake sale in aid of The Irish Heart Foundation, we raised €1130. Tá Coiste na dTuismitheoirí fíor-bhuíoch as ucht an líon mór málaí eadaí a chuir sibh isteach chun na scoile. 115 Málá ar fad,is iontach an ócáid bhailithe airgid í. The Parent's Committee appreciate all the bags of clothes (115 bags) that were sent in for their fundraising appeal. ​na héadaí spóirt a chaitheamh gach lá don traenáil. Bhronnamar seic €3,631 ar Bernadette ón Oispís. Ár mbuíochas libh uilig as ucht tacú linn don Rith Urraithe. Bhí páistí na scoile gnóthach ag crochadh na gciseán agus ag cur síolta sa chlós. Míle buíochas le Máistír Conal agus leis na tuismitheoirí a chabhraíonn leis sa ghairdín. Tá Ráiteas um Chumhdach Leanaí ar an suíomh anois ag an nasc seo thíos. Tá Measúnacht Priacail ag an scoil atá le feiceáil ach í a iarraidh ar an Oifig. There is a Child Safeguarding Statement on the website now at the link below. The School also has a Risk Assessment which can be seen on request through the Oifig. We had a good crowd of around 50 parents in the school last year for this interesting talk. A booklet was given out on the night and there are more copies for anyone who would like one. We can’t send them home with children so you are asked to collect it in person from the school if you want one. Go minic bíonn an baol ann go mbíonn do pháiste ag caitheamh níos mó ama ar an idirlíon. Tá sé níos deacra súil a choimeád orthu freisin. Is fiú go mór na hailt seo a léamh. Some articles that are worth reading as children spend time online. Tá leideanna faoin tsábháilteacht idirlín le fáil ar an leathanach "Nascanna Úsáideacha"
We have tips on Internet Safety on our page "Nascanna Úsáideacha"
​Cuimhnímis ar ár gcairde atá imithe uainn. Ar dheis Dé go raibh a n-anamacha dílse. Bainigí taitneamh as Oíche Shamhna ach fanaigí amach ó thinte ealaíne agus ó thinte cnámha gan feitheoireacht. Bíodh Oíche Shamhna shlán agaibh ar fad ! Enjoy Halloween but stay safe ! Fire Safety For Kids ! Ba bhreá linn cur le labhairt na Gaeilge sa chlós ar maidin. Tá cúpla nath simplí anseo a chuirfidh tús brea Gaelach leis an lá scoile duit. We’d love to add to the amount of Irish spoken in th ayrd in the mornings. There are a few simple sayings below that will get your school day off to a grand, Irish start! Conas atá tú ar maidin? How are you this morning? Nach bhfuil an mhaidin go hálainn? Isn’t this morning lovely? Nach bhfuil an mhaidin go hainnis? Isn’t this morning miserable? As Lára mentioned at the AGM, there will be a new model for Learning Support in place from September. Further information can be found at the NCSE link above. Bíonn Ciorcal Cainte sa Leabharlann sa scoil gach Luan ar 20.30 i.n. - cupán agus caint. Fáilte roimh chách ! We have a 'Comhrá' group in the school library every Monday at 8.30 p.m. - a cuppa and a chat. All welcome ! Cód Glas Nua an Taistil Gliogáil Anseo!